You’ll be amazed at how well this holds using our proven suction cup design. It holds up to 12KG. 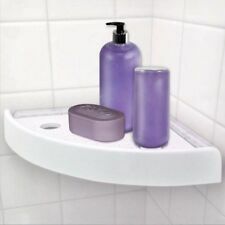 Want to install a handy corner basket in your shower or kitchen—without gluing or drilling holes in the wall. Inflatable Terry Cloth and Vinyl Bath Pillow. 180x180cm Green Leaf Print Shower Curtain Bathroom Fabric Hanging Sheer 71"
Size: Approx. - Fashion and chic shower curtain,refresh bathroom with simple, graceful charm. 1 piece Shower Curtain. Shower curtain should be wiped clean with a damp cloth and hung to dry. - Hang with 12 plastic shower rod hooks and nickel plated brass eyelets. Including Lotion Dispenser, Soap Dish and Tumbler. 3PC Blue Mosaic Ceramic Bathroom Set. Blue Canyon. Set bestehend aus: Adapter mit Klebering Klebstofftube Schlüssel – zum Öffnen und leichteren Entleeren der Tube. Für glasierte Fliesen. Sie sind zur Rückgabe gebrauchter Batterien als Endnutzer gesetzlich verpflichtet. This elegant set from Le Bain will provide better storage and organizing options for your bathroom accessories the French way. Made using stylish and durable stoneware material, each has a classical and distinct French text, printed to accentuate your bathroom decor with flair. Liquid Pump Dispenser H12 x W8 x D8 cm Toothpaste Tumbler H13 x W8.5 x D8.5 cm Soap dish H3.5 x W14 x D11 cm . BATHROOM ACCESSORY SET. CLOTHES HOOK. 24" TOWEL BAR. REQUIRED BEFORE WE CAN DESPATCH. Toilet paper holder is approx. Hanging towel with velcro closer with matching spare toilet paper holder. Towel is approx. One set fuel transfer pump. Suitable: Diesel, engine oil, hydraulic oil etc. Maximum Flow: 4.0L(water). 1,The real color of the item may be slightly different from the pictures shown on website caused by many factors such as brightness of your monitor and light brightness. Gone are the days of just leaving your toilet roll on the floor, once you've experienced the luxury feel of the Park Lane Elmley Toilet Paper Holder, you'll never want to place another roll on the floor. This toilet paper holder is a perfect addition to your bathroom if you're looking for finishing touches for your freshly decorated bathroom. The bin has removable plastic bucket for easy emptying. Stylish retro design ideal for any bathroom. The brush has a removable plastic base container. Strong brush. Bucket height: 26.5cm. Bucket height: 19cm. IDEAWORKS® PRODUCT - OPEN AIR FIBER - MOLD RESISTANT!!! Ample storage space for shower gel, shampoo etc. • Fits from ceiling to bath or ceiling to floor. Features : • 4 Shelves.